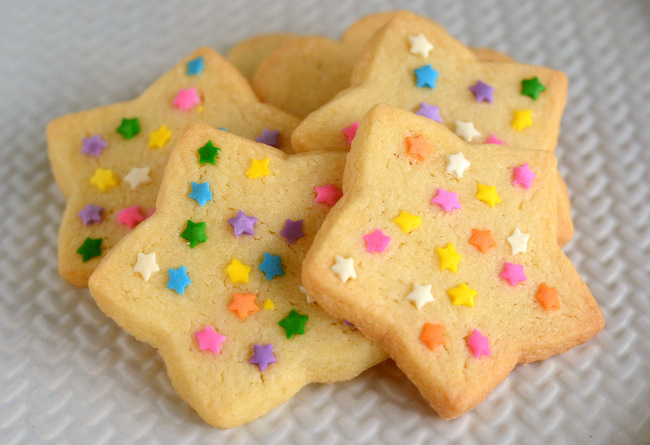 Adding sprinkles seems like an easy way to decorate a batch of butter cookies or other relatively plain-looking cookies for holiday or some other festive occasion. They’re bright, colorful and, unlike frostings and glazes, need no prep time. But sprinkles can come with their own problems because they don’t always end up where you want them to be; frequently, when you’re applying sprinkles, you end up with more on the baking sheet than you do on the cookies themselves! Sprinkles have a hard time sticking to dough that isn’t tacky enough. For instance, when cookie dough is rolled out on a lightly floured surface, it picks up some flour so that it isn’t sticky and can be handled easily – and that same flour will prevent sprinkles from sticking to the cookies. There are a couple of simple things that you can do to help those sprinkles stick. The easiest thing to do is to brush the tops of the cookies with a little bit of water or milk, using just enough to dampen the cookie dough and no more. This will help the sprinkles stick and won’t change the finished appearance of the cookie when you’re done baking. You can also brush the cookies with a little bit of egg white, which will provide some adhesive, but will also make the cookies appear a bit darker and shinier. Take a sheet of notebook paper and fold it in half. As for technique, pour the sprinkles down the “channel” to direct them onto the cookies, rather than shaking the container of sprinkles all over the baking sheet to eliminate the mess and waste usually associated with sprinkle-ing cookies. Finally, if you’re using big, round sprinkles, you’re going to need to press in the sprinkles when you apply them. Large nonpareils, for instance, need to be “anchored” into the cookie dough, or they simply won’t stay put on the trip from the countertop to the oven. Last day to enter the Holiday Cookie Contest! Next PostNext Last day to enter the Holiday Cookie Contest! I’m guilty of the ‘sprinkles all over the countertop and none on the cookies’ – I like the tip about the water, I always used to just ‘smush’ the sprinkles into the cookies and prayed they’d stay, but the water seems like a MUCH better solution! i have got to say, this is very helpful! it is an issue i have had in the past but thought it was just me! Great tip – thank you! They look so good. Thanks for the tips. Brushing on the water and using notebook paper to guide the sprinkles seems like an obvious solution, but it never occurred to me to do that! Thank you for the good tips! I usually end up making a huge mess when working with sprinkles! These are great tips. I always make what is effectively a simple syrup (just not very sweet) by boiling some water and sugar until the sugar is dissolved and brushing it over cookies before applying the sprinkles. It works especially well for my gingerbread cookie recipe because the base recipe isn’t very sweet on its own (but I use it for sugar cookies and others too). Great Tips! I normally use egg whites to keep the sprinkles sticking. 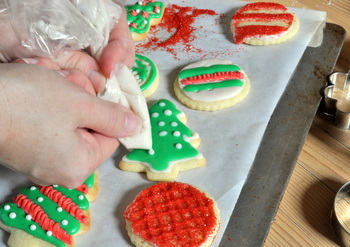 For large, heavy sprinkles, I attach them by hand using a dot of icing if they won’t stay put. Thanks so much! It has been years since I made cookies with sprinkles–I couldn’t remember how! One tip I saw elsewhere that might be useful is to hold the cookie cutter used to make the shape over the cookie while applying the sprinkles. This keeps them from going all over the sheet and onto other cookies. this can also be done using a different cookie cutter shape–for instance a heart shape over a gingerbread man etc. Is there a way to prevent the color of the sprinkles on my frosted cookies from running? Amethyst – The sprinkles should go on before baking to really hold them in place. Some sprinkles, like “jimmies,” tend to lose their shape faster than others, but most sprinkles should hold up fairly well for the time and temperature you described. I would experiment with different types of sprinkles (some are harder than others) to see what gives you the best results. My son and I brushed water onto our shamrock cut out cookies then, sprinkled crystalized green sugar onto them and baked at 350 for 7 minutes. No color changd and they are delicious! 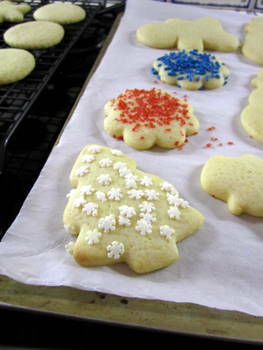 We put the sprinkles in separate small bowls, then press the cut out cookies in the desired color of sprinkle. We place them on a parchment lined baking sheet. Just a few fall off with this method. Every Christmas I make anisett cookies. The frosting is anise flavoring with powered sugar and milk. I dip my baked cookies in frosting then add non pareils on top of frosting. My problem is the sprinkles run after a couple of hours and they look terrible. Do you have any solution? I have used both the water and egg white methods to adhear the sprinkles on the cookies, both work well. I use a infant stainless steel feeding spoon to put the sprinkles on the cookies, the small size spoon makes it easier to cover just the cookies and not the tray.